For years Atheists have petitioned the Government to have their own National Atheist Day. After years of being turned down, the Government finally gave them an official day: April 1st. The amazing thing is not only the fact that this is on April Fools’ Day, but Scripture also tells us it is the fool that says there is no God. Also amazingly enough, on every April 1st, there is a debate between an Atheist and a Christian on the topic of Does God Exist. 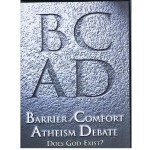 this is a debate by Christian (Ray Comfort) vs. Atheist (Ron Barrier). So think about this, on April Fools’ Day, Comfort the Christian vs. Barrier the Atheist. For years Atheists have petitioned the Government to have their own National Atheist Day. After years of being turned down, the Government finally gave them an official day: April 1st. The amazing thing is not only the fact that this is on April Fools’ Day, but Scripture also tells us it is the fool that says there is no God. Also amazingly enough, on every April 1st, there is a debate between an Atheist and a Christian on the topic of Does God Exist. During the first week of this month, I am airing such a debate by Christian (Ray Comfort) vs. Atheist (Ron Barrier). So think about this, on April Fools’ Day, Comfort the Christian vs. Barrier the Atheist.